"A picture is worth a thousand words," in theory. This breaks down, however, when the person viewing the picture mentally reduces the picture to a two-word label, translates that two-word label into a different two-word label, and then acts based on label #2. Meaning what, exactly? Meaning that yet again I have the wrong haircut, even though I took a photo in with me. 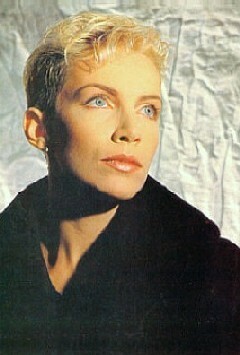 I blame Annie Lennox. No, that's not right. I blame the common assumption that women ought to have long hair, which seems to be so deeply held by so many people that when they see Annie Lennox, their minds go into illogical fits and they can't think anything more coherent than "OMG SHORT HAIR!!!!" This is the photo I took in with me, the haircut I wanted. This is the haircut I got. Let me describe both cuts in words. Haircut #1: Extremely short on the back and sides; a little longer but still short on top; bangs longer, but not falling into the eyes. Haircut #2: Hair clipper + #3 guard = buzz cut! Luckily hair grows back. And once we dyed it auburn it didn't look quite as severe as it did at first. But I think I'm going back to having spiritualmonkey cut my hair instead of going to SuperCuts. With Pirate doing it, I can be as picky as I want. I can get it touched up as often as it needs it ("Grab the clippers and come on into the bathroom, sweetie, I'm getting shaggy"). He's gotten not bad at it in the past. And at least then I'm not stuck with the knowledge that not only do I have the wrong haircut, I actually paid someone money for it. We met on the Playa in 1998, right? Back during the brief period when I had microbraids. Man, were those things heavy. I was glad when it was time to take them out. I happen to like short-haired women, in general. Actually, what I like is distinctiveness, anything that sets someone out. Given much of CA culture, short hair falls in that category.